After two consecutive weeks of sub-freezing temperatures and after hearing more than one raving review of the australian sheep-skin boots (including Christa’s here), I decided that I wasn’t up for thawing out my toes after coming home anymore and that I would very much like a pair of Uggs. And so I let it be known that all I wanted for Christmas is Uggs. Overpriced, trendy, but oh-so-toasty Uggs. On Monday after a weekend of scouring the local shopping establishments and a day searching the internet, my good Nate informed me that Uggs were sold out everywhere. Apparently, I’m not the only one with Uggs on my wish list. and to show me her brand new Uggs. Thanks Shanel! You’re the best. She also brought a bag full of beautifully wrapped gifts from her and her happy boyfriend, Mike (who likes to read this blog occasionally, but don’t tell anyone. It’s a secret). Ava got to open her present from Mike first. Let’s see what she got. Knives? Are those knives? She loves to help in the kitchen, yes, but knives. Come on Mike. You read the blog. You know she’s only three. Oh wait. There’s more. Phew, Mike, I was worried there for a minute. NO! Uggs! Ava gets Uggs! My Ava gets warm, adorable, snuggly Uggs. Santa how could you let this happen? Ava was hoping you would bring her a candy cane, and I, I wanted the sold-out, unavailable, frostbite-preventing Uggs. It was very simple Santa. Little candy cane: child. Expensive boots: mama. Look at these two: Matching ponchos, matching boots, matching smiles. A huge thank you from Ava for the leopard skirt, sparkly poncho, and of course the Uggs. Am I the only mama whose three-year-old dresses better than they do??? P.S. Look what Shanel wrapped up for me. 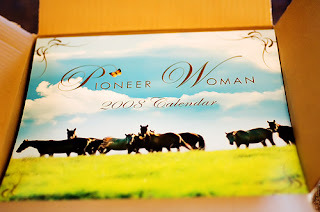 The Pioneer Woman’s calendar! If you haven’t read her blog yet, now would be the time. She is giving away a $500 gift certificate to Amazon books tonight! If I don’t win that at least I’m due for a candy cane. I just bought my first pair of Uggs one month ago and I’m not sure how I survived Minnesota without them. I found mine at Von Maur. Check there…you might just find what you want for Christmas. Also remember…don’t wear socks with your new Uggs. Looking good Ava! Nate better get his shotgun ready if she keeps looking that good (to ward the boys off that is!). I was glad to find a post today as I was suffering from blog update withdrawal. I’m curious too about your advent gifts, do tell. Oh Rachel, I sympathize completely! My girls are always better dressed than me. Jake is far and away more stylishly dressed than his mother. And why not? He grows into a new wardrobe four times a year…. bugger! 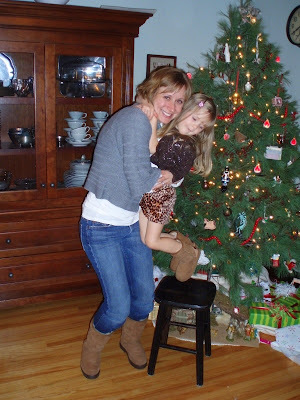 Hoping Santa finds one more pair of Uggs somewhere up in the North Pole with your name on them…. Not only are my kids better dressed, but they get new clothes for every season! Here’s hoping Santa keeps his signals straight for MY house! I sincerely do not need any more Play Doh and I doubt Kieran would be thrilled with a new external hard drive. Anyway, sorry about no Uggs for you yet, Rach. But gotta love Ava in them! P.S. One of Santa’s elves saw Nate shopping for YOU in the mall the other day. Santa’s elf told me and now I know what you’re getting! But not telling. And it’s not Uggs. But maybe Santa will still be able to pull a few other strings before then.